Spring is almost here and with it brings youth sports leagues. We love helping local kids and their families live healthy, active lifestyles, which is why every Eat’n Park restaurant has funds set aside to support at least one youth sports team! So if your team needs a uniform sponsor, give us a call! Last year, we sponsored 100 local youth sports teams. Sponsorships are on a first come, first serve basis, so act fast! Click here to find the phone number for your local Eat’n Park. 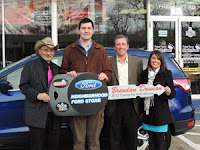 Congratulations to Brendan Dawson, the 2012 Eat’n Park Caring For Kids Car Raffle Winner! Every year during our Caring for Kids Campaign, we raffle tickets for a chance to win a brand new car, and the selection of the winner is one of the most anticipated events following the campaign. Back in December, we visited Children’s Hospital of Pittsburgh of UPMC to pick the winning ticket. 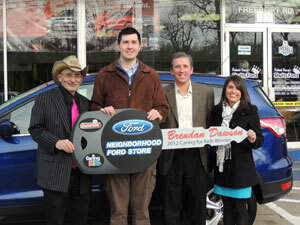 Last week, we got to present the winner, Brendan Dawson of Cheswick, with his brand new 2013 Ford Escape! Brendan in his new ride! 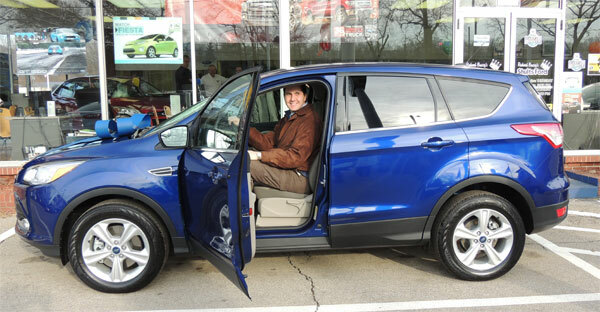 We’d like to thank our friends at the Neighborhood Ford Store for graciously donating a vehicle for this raffle. This was a record-breaking year for our car raffle, with over 77,000 tickets sold and $154,000 raised for our Caring for Kids Campaign, which benefits local children’s hospitals. Also, a special thanks to Shults Ford in Harmarville for hosting our car presentation! We’d also like to thank our friends at KDKA for coming out last week to interview Brendan and his family. You can see the story here. 20% Off Takeout – Wednesday ONLY! Let’s Go Pens! The hockey lockout has officially ended and we’re celebrating with a 20% off takeout coupon for the first Pens home game on Wednesday! We wanted to help you start the New Year off on the right foot – with a coupon for $2 off your next breakfast at Eat’n Park! Check out our breakfast menu here. There are only a few weeks left for our Sunrise Breakfast Wrap and Banana Crunch Pancakes! If you didn’t already know, we love soup! Which is why we offer homemade Chili and Chicken Noodle Soup every day. But we also offer a variety of other soups throughout the week. And did I mention our soups are great to go?! They are only $6.99 a quart! I can’t believe that 2012 has come and gone. When I look back, I’m amazed at what we’ve accomplished. 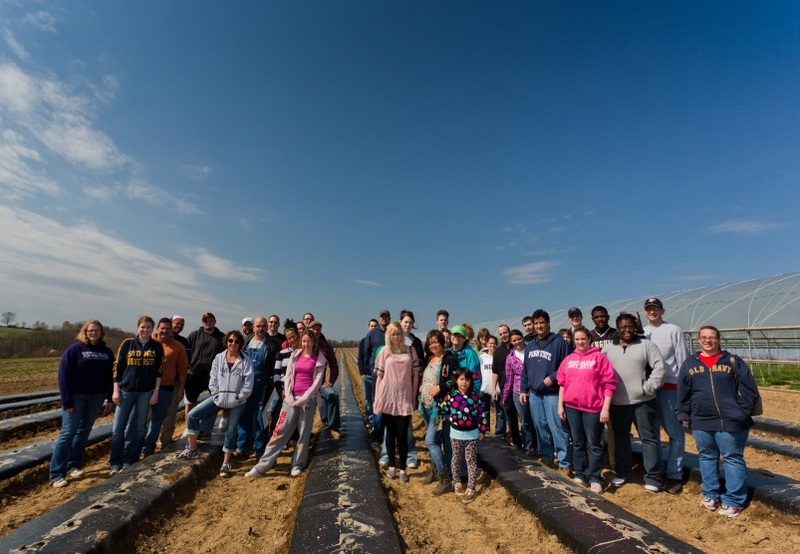 At the start of the growing season, we had a group of team members from Eat’n Park help Brenckle’s Farm plant crops for the 2012 growing season. We enjoyed spending the day with our partners at Brenckle's, as well as helping them sow the seeds for produce that we’d later feature in our restaurants. In fact, zucchinis from the 7,000 seeds we planted that day were used to make the homemade zucchini bread that we offered in our restaurants. ﻿Not only was this the year of bringing more local products into Eat’n Park, but it was also a milestone personally for me in regards to volunteering. 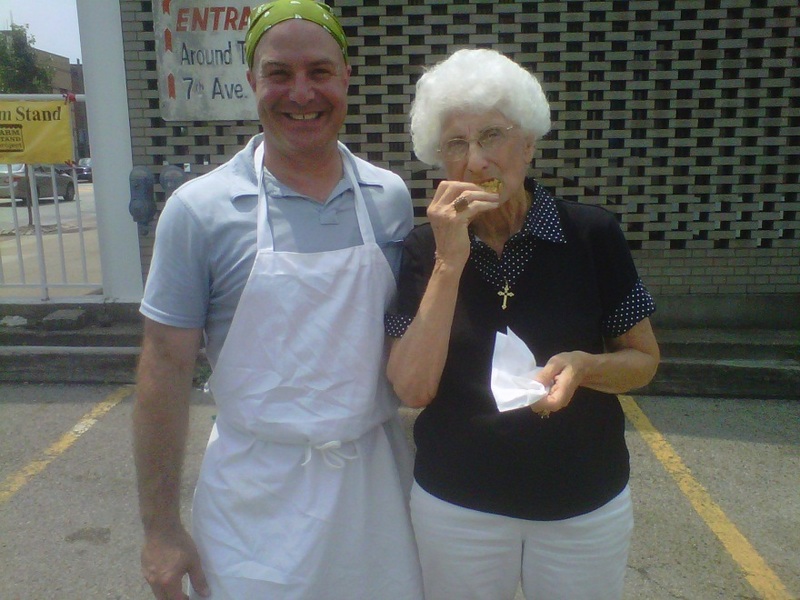 For the past 3 years I’ve been involved with the Pittsburgh Community Food Bank’s Farm Stand project. Through this program, myself and other members of the Eat’n Park team, as well as other folks from the culinary community in Pittsburgh, have given low-income residents ideas on how to incorporate fresh, local food into their everyday diets via a cooking demonstration at these events. This year was the first time that each of us stayed at the same Farm Stand throughout the entire growing season. The Farm Stand that I participated in was in Homestead, and it was run by one of the Community Food Bank's partners, Rainbow Kitchen. The beauty of going to the same Farm Stand is that I got to know the folks from Rainbow Kitchen and also the people who purchased produce from the stand. It was really a lot of fun showing people how to prepare dishes utilizing local produce. Though it’s not related to my work with our sustainability initiatives, I also wanted to share one of my other favorite volunteer activities from last year. At the close of 2012, Eat’n Park decided to do a thing we called “Random Acts of Smiley”.We looked for small ways to give back to the community during the holiday season, with the hope that we would inspire others to pay this kindness forward. My favorite of these random acts was the day that we paid for people’s parking at Children’s Hospital of Pittsburgh of UPMC. If you visited the hospital on December 19th, Eat’n Park picked up your parking tab. It was the most rewarding and heartfelt day that I’ve had in a long time. People would come down the elevator and walk over to the pay station, where they were greeted by a volunteer from Eat’n Park. We would then give them a voucher which covered their parking, regardless of how much their parking fee would have been. One of the people that I gave a voucher to looked at me and said, "You just put $60 back in my pocket.” She was at the hospital for 6 days caring for her son and she said, “this is such a wonderful thing that Eat’n Park is doing this close to the holidays.” The event made me feel good about working for a company that gives back to the community. Several tears fell down my cheek that day, and I hope we turn this into a yearly tradition. So now we move into 2013, and I’m in the midst of setting up the farm tour schedule, working with our chefs on other local items we can feature, and looking forward to another fulfilling volunteer year. Believe it or not, spring is right around the corner, so you’ll be hearing from me soon as I visit with our partner farms.